Charmed Life! Let me tell you a little about it. There's this kiddo named Cat (Eric, really) Chant and he and his sister, Gwendolen, have been newly orphaned by a boat accident. They live for a bit with a kindly witch where Gwendolen gets magic lessons and Cat gets violin lessons -- until his sister changes his violin into a cat. Everything seems okay until Gwendolen and her tutor concoct a mysterious scheme, of which one of the steps is to get the kids living with their parents' cousin, the current Chrestomanci. They don't really know who he is or what he does but head off to his castle anyway, taking nothing with them but Gwendolen's secrets. Many will see this story as a cautionary tale -- either about choosing carefully whom you trust or about telling the truth and not holding things back. If Cat had done any of these things, he wouldn't have already (unknowingly) lost some of his nine lives. I also think it's a tale about finding your place and your talents and embracing them. 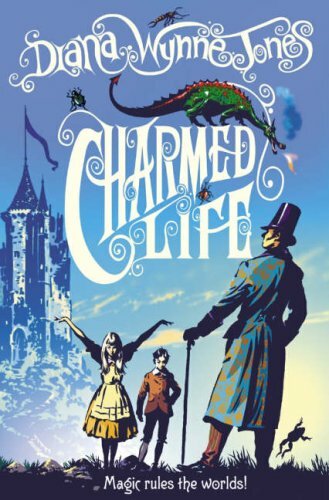 If only we all had the chance of our place being Chrestomanci Castle! Question of the Day: The reason an enchanter has nine lives is that he has no counterparts that existed or survived in the eight related worlds. Would you rather have nine lives all to yourself or eight living counterparts in the other worlds? The magic is VERY tempting! Dying nine times would not be so much fun. However, I'm intrigued by the ability to travel to different worlds. It might be worth it. I tend to think I'd rather have the counterparts -- wouldn't it be fun to meet them? -- but it would be lovely to have the magic and not have to worry about my personal safety. On the other hand, the magic and the nine lives does seem to come with an awful lot of responsibility, so on balance I'd rather have no magic but my life and choices are my own. I just finished this book today and enjoyed it very much! I set my other books aside for a day and read it because of you and because it is March! So much fun! Thank you!